Limited to 320 hand-numbered copies on Black Vinyl. 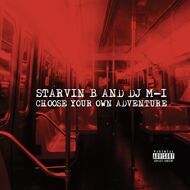 Queens, New York MC Starvin B teams up with Irish producer DJ M-1 to bring you "Choose Your Own Adventure", a 7-tracks EP packed with nothing but quality hip-hop joints, bringing back some of that gritty and classic hip-hop flavor with Starvin B's ill flows and DJ M-1's brilliant productions. Don't sleep on this banger! Limited edition of 500 copies, first 180 on CLEAR RED vinyl and 320 on BLACK Vinyl.